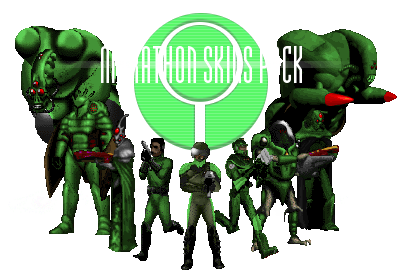 The Marathon Skins Pack v1.0.7 has shipped! All personnel are required to arm themselves and fight for their lives. • The usual round of painfully minor bugfixes. Fixed Syphon Tick landing sound, and usefail sound for a secret skin. • Converted many sounds to .ogg, shaving off 4MB. It's better than nothing. • Made non-purple components of M1 Enforcer's gun remain blue. • Fixed in 1.0, but forgot to note it: Dive sounds restored, now that Zandro doesn't play them on respawns. • XDeath sounds corrected for the M2 Bob, M1 Trooper, and M2 Trooper. • Crush sounds removed - they weren't playing anyhow. • Spaces removed from all skin names. No more quotations needed in the console! • Mugshot added to the Security Officer skins, donated by TerminusEst13. • Edited translations for M2 Hunter and picked better standing frame. Renamed sprites to reflect source. • More Bob and Vacbob lines added, reworked their melee sounds, added subtitles to SKININFO. Fixed vacbob/traitor0 breakage. • Changed the blue-ish shades on the M2 Enforcer to gray. • Added *Pain25, *grunt, and one extra taunt to the S'pht Compiler skin. • Flavor text added to SKININFO because why not. Last edited by President People on Wed Feb 21, 2018 6:01 pm, edited 10 times in total. In the future, everyone dresses in lycra bodysuits. Last edited by Medicris on Mon Apr 20, 2015 8:07 am, edited 1 time in total. Six new skins, bringing the count to sixteen. Long overdue update! Fifteen new skins added, bringing the count to to thirty-one skins! Hope you all enjoy! • F'lickta, Wasp, Cyborg Tank, S'pht'Kr, Pfhor Drone, Juggernaut (M1 and M2), Drinniol, Looker, Syphon Tick, Admiral Tfear (donated by TerminusEst13), and 4 hidden skins (3 are cheat skins). Count is now at 31 skins. Found a typo after I tested everything and confirmed it worked. I didn't want to just throw out a hotfix without making it worthwhile, so I converted as many sounds to .ogg as possible without making them turn out terrible. It's under 10MB now!